Am I the only one that enjoys #ThanksgivingLeftovers more than the main meal itself? We eat around mid-day, and by the time I prep, set the table, and cook, I really am just looking forward to sitting down with my family, the food is secondary. But later in the day, and in the following days, I love having those leftovers in the fridge. My husband makes the best turkey sandwiches. I whip up potato pancakes and stuffing waffles. I'm always on the lookout for new ways to serve them up. I found this recipe for Spicy Turkey Quesadillas on the Taste of Home website and knew that I would be adding it into my menu this year. I made some minor changes, using what I had on hand. Greek yogurt cream cheese, jarred jalapenos, multigrain wraps. These came together super quickly using the panini press, and they disappeared even quicker. I've fallen into a bit of a rut when it comes to veggies. Green beans and corn, corn and green beans. I like lots of vegetables raw, but I'm trying to expand my base of cooked veggies. I found this recipe in Taste of Home's Holidays & Celebrations cookbook. This is the 3rd recipe I've tried, and they've all been winners. It really doesn't get much more simple than this. I had baby carrots on hand, so that's what I used. No fresh thyme at the grocery store this week, so I used dried. About halfway through, I gave the pan a shake to make sure nothing was sticking, but it was no problem. If I'd left them alone I would have gotten more of the nice caramelization on them. They were great as a side to roasted chicken, and I'll be making them again for Thanksgiving. Thank you so much to Deidre C. for sharing her recipe! I've been trying to eat a little bit healthier, and one of my biggest struggles has been game day. 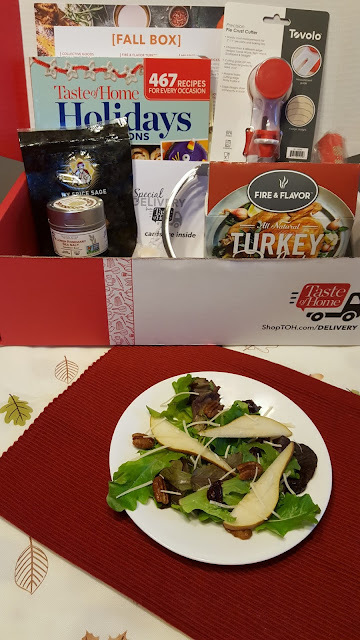 Last week I talked about my Fall Special Delivery Box from Taste of Home, and I found this recipe in the included cookbook, Holidays & Celebrations. I switched out parsley for the cilantro, I'm just not a fan. I forgot to reserve some for garnish, and had to use dried for that. I really liked the different textures of this, the crunchy peppers, the smooth chickpea mixture. All the colors of the peppers make for a pretty plate too. It's great that it can be prepared ahead, that way I can enjoy the game instead of being in the kitchen. 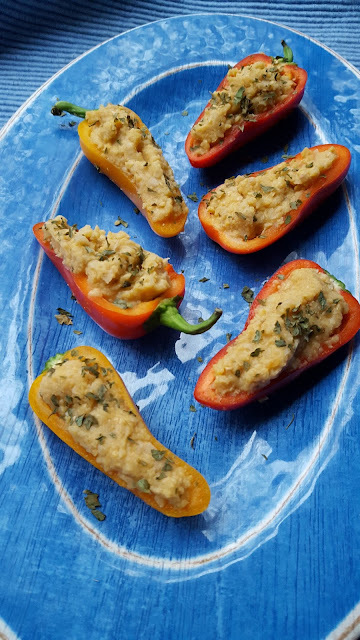 Thank you so much to Christine H. for sharing her recipe! Taste of Fall Salad- Taste of Home Tuesday! I just love fun mail days! And there's nothing more awesome than the arrival of a Special Delivery box from Taste of Home. They're offered four times a year, and each one comes packed with fun gadgets and tasty items, plus the trusted recipes that you expect from the Taste of Home family. Want to order your own Special Delivery box? Go check it out here, and receive free shipping with the code FREESHIP! Right away, I curled up with some hot apple cider and spent some time with the cookbook, Holidays and Celebrations. I've marked so many recipes to try! First up on my to-do list was the Taste of Fall Salad. I loved the glazed pecans, and the use of pear. I tossed in a few dried cranberries because I had them on hand. It made for a great side dish, and adding some grilled chicken made for an amazing dinner.